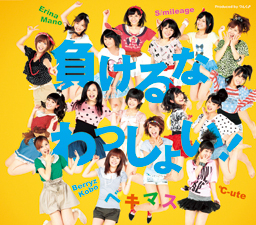 Bekimasu reveals info on new single, "Makeruna Wasshoi!" Special Hello! Project unit Bekimasu has just revealed details on their upcoming single, "Makeruna Wasshoi!" The unit consists of Berryz Koubou, C-ute, Mano Erina, and S/mileage and the song was released through Chaku-Uta back on July 16th to help encourage the Japanese people. "Makeruna Wasshoi!" will be released as a physical single during their Hello! Project 2011 Summer concert tour for only �800. Check out the track list and cover for the single below! ONE OK ROCK reveals full PV for "NO SCARED"! mihimaru GT announces their 6th album, "mihimalight"!